Today is my day to relax, recoup and regroup. Just for today. Yesterday I pitched, hit, threw, and ran (a very short distance) in a relaxed, laughter-filled softball game at my 40th high school reunion in Tacoma’s Cheney Stadium. Both during the game and the reunion dinner in the evening, I had a chance to visit with people who grew up with me. I appreciated renewing and reinforcing friendships, especially since I likely will not be around for my 50th reunion. As the “Faithful Scribe” of the Reunion and Softball Committees, it was a wonderful to see so many people enjoy the months of work that went into making these events happen. I was also surprised (and pleased) to learn how many classmates have been following my lung cancer journey on my blog. It was a terrific day! Now that the reunion is over, I’ve hit a turning point in the summer. The looming deadlines imposed by outside events and projects have been met. In addition to helping plan my high school reunion, I have been up to my eyeballs in lung cancer patient advocacy projects over the past three months: working on the first-ever LUNG FORCE walk, collaborating with a group of metastatic patients on changes in lung cancer treatment guidelines, attending the big ASCO clinical oncology meeting in Chicago, preparing and giving speeches at conferences and events, writing articles and guest blog posts, and generating panel proposals about lung cancer for upcoming medical conferences. Somewhere in there, I wrote blog posts, contributed to #LCSM Chat activities, researched new lung cancer developments, and communicated online with others in the lung cancer community. I’m reminded why I’ve been feeling stressed this summer! So, just for today, I’m resting up from all that exercise and socializing at the reunion, as well as reviewing what I want to do next. I still have a long list of projects that don’t have externally-imposed deadlines. I don’t handle pressure as well as I did before cancer (not that I handled it particularly well before) and need to wind down a bit and set priorities before jumping back into action. And I MUST jump back into action. I feel a pressing need to complete family and advocacy tasks ASAP, while I am able. Even though I’m feeling pretty good right now, I can’t forget that my cancer might recur at any time, and people—including my friends—are dying of this disease every day. But for now, I’ll bask in the fact that I just wrote blog post #100 for Gray Connections. Tomorrow hubby Gerry and I start cleaning out the garage for the first time in 22 years. No stress there. This entry was posted in Advocacy, Lung Cancer, The Bright Side and tagged high school reunion. Bookmark the permalink. Congratulations on all you’ve done and will do, including completing your 100th blog post! So glad you had a great time at the reunion. I’m glad you’re relaxing – you deserve it. You do some wonderful work, and we are so lucky to have you advocating for us. Thank you, and enjoy your well deserved day of rest. This posting is such fun! I too am going to my 40th this year, in October. 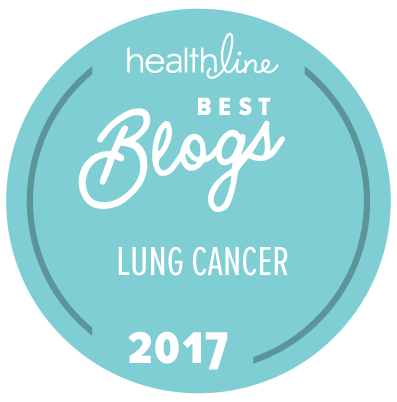 thanks for advocating for all of us affected by lung cancer….